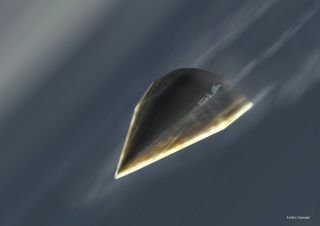 An artist's illustration of DARPA's Hypersonic Technology Vehicle 2 (HTV-2) travelling at 13,000 mph, or Mach 20, during its Aug. 11, 2011 test flight. The U.S. military aims to fly a full-scale rocket plane at 20 times the speed of sound by 2016, officials announced last week. The Defense Advanced Research Projects Agency, or DARPA, laid out its plan to develop and test-fly the hypersonic vehicle in a press release issued Friday (July 6). The so-called X-plane would travel at Mach 20 — roughly 13,000 mph (20,900 kph) — allowing the military to reach any spot on the globe in less than an hour. Further, the vehicle would be "recoverable," according to the release — meaning the government could get it back. "We do not yet have a complete hypersonic system solution," said Gregory Hulcher, director of strategic warfare at the Office of the Under Secretary of Defense for Acquisition, Technology and Logistics, in a statement. "Programs like Integrated Hypersonics will leverage previous investments in this field and continue to reduce risk, inform development and advance capabilities." The Integrated Hypersonics program will focus primarily on five areas: thermal protection; aerodynamics; guidance, navigation and control (GNC); range/instrumentation; and propulsion. Thermal protection systems are a key requirement for hypersonic flight, which is traditionally defined as anything above Mach 5. Vehicles zooming through the atmosphere at Mach 20 experience temperatures in excess of 3,500 degrees Fahrenheit (1,927 degrees Celsius), DARPA officials said — hot enough to melt stainless steel. Desired advances in aerodynamics and GNC technology will allow the X-plane to make real-time, in-flight adjustments to account for changing conditions — such as wind gusts — and let it glide safely to its destination. As far as propulsion goes, IH won't simply adapt an existing rocket designed for space missions. Rather, DARPA is working on a new launch vehicle that would insert the X-plane into its desired trajectory, officials said. The hypersonic vehicle would also have its own integrated rocket to give it a boost during flight, they added. DARPA has had an active hypersonics research program for years. For example, the agency has conducted two flight tests of a prototype rocket-launched glider, called the Hypersonic Technology Vehicle 2 (HTV-2), in the last two years. In the more recent test, launched in August 2011, HTV-2 reached Mach 20 but stayed aloft for only nine minutes. HTV-2 is part of the advanced Conventional Prompt Global Strike weapons program, which aims to develop a bomber capable of reaching any target on Earth within an hour.